Travis Hale is a pharmacist and co-owner of Remington Drug Co where he practices pharmacy along with his partner, Al Roberts. He earned his BS in Biochemistry from Virginia Tech and his Doctor of Pharmacy from the Medical College of Virginia at Virginia Commonwealth University. His pharmacy experience includes practice in community and long term care pharmacy settings. He worked as a pharmacy technician right out of high school for CVS. Once in pharmacy school, he worked as a technician for Family Care Pharmacy, a long term care pharmacy serving assisted living facilities and homes all over the state of Virginia. Upon graduation from pharmacy school in 2007, Travis and his wife, Vicky, moved to Culpeper, Virginia and he began working at Remington Drug. 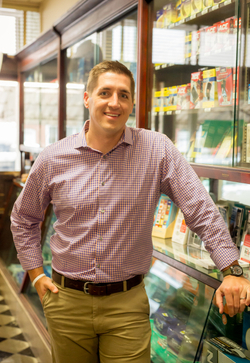 Travis has helped keep Remington Drug current with today’s pharmacy demands and expand the services offered while still keeping the charm of one of America’s small town pharmacies intact. Travis is an active member of several pharmacy organizations including the National Community Pharmacists Organization (NCPA), Virginia Pharmacists Association (VPhA), and American Pharmacists Association (APhA). He also volunteers his time each month at the Culpeper Free Clinic pharmacy. Travis married his wife, Vicky, in 2006 after they met while they were both in professional school at MCV/VCU. Travis has 2 boys, Hunter and Jackson, who provide him with plenty of excitement on a daily basis when he’s not at the pharmacy. 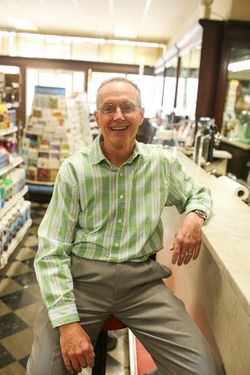 Travis’ personal goal and goal for the pharmacy is to maintain the level of service and quality as well as earn the same community respect that Wilbur Heflin has after his 43 years of being the sole owner and operator of Remington Drug Co. I was born in Harrisonburg Virginia in the heart of the Shenandoah Valley. Except for a seven year stretch in the 1960’s, my entire life has been spent in the great Commonwealth of Virginia. I have a younger brother and sister. I graduated from Halifax County High, attended the University of Richmond for 2 years, and graduated from the Medical College of Virginia in 1977 with a BS in Pharmacy. I came to Warrenton after graduation and worked at Rhodes Drug Store until it closed at the end of 2005. While working at Rhodes I met Sharon Godfrey who also worked there and we were married in 1979. During this time I also worked on my day off for Mr. Wilbur Heflin and the Remington Drug Company. Most people feel blessed to have one great job but I have been fortunate enough to have two such opportunities with Rhodes and Remington Drug. In 2006 I came to Remington Drug full time. I am a member of two national pharmacy organization, two state pharmacy organizations, I am a supporter of the Fauquier Free Clinic, and a speaker to Cardiac Rehab patients at Fauquier Health Systems Wellness Center. I am also certified to give immunizations such as flu, shingles, and pneumonia. I enjoy working in the yard, football, and bowling. I believe my greatest opportunities to help and educate patients is in a community pharmacy like Remington Drug It is truly a pleasure and a privilege to contribute to the healthcare program of all our patients. 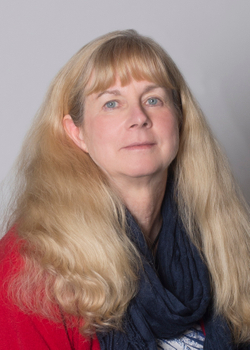 Margaret Rowe has been a pharmacist for 41 years, graduating from Virginia Commonwealth University first in 1976 with a BS in pharmacy, and subsequently, in 2006 with her Doctor of Pharmacy degree. While she has practiced in a variety of settings, including a veterinary medicine teaching hospital at VPI and SU, most of her pharmacy career has been in the hospital setting. She recently retired from Fauquier Health and now practices at the Fauquier Free Clinic as well as Remington Drug. Margaret is also a preceptor of pharmacy students for Shenandoah University School of Pharmacy, as well as Virginia Commonwealth University. Margaret has provided education for patients, physicians, nurses, and students throughout her career. Currently, her emphasis is on diabetes education. When not working in the pharmacy, Margaret enjoys being a civil war living historian on 19th-century medicine and apothecary practices, participating in events around the area. She is married, the mother of 3 men, and the grandmother of 4 infants and toddlers. She is also an avid horse rider. 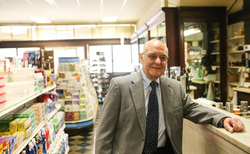 Previous owner of Remington Drug from 1972 to 2015.